Stay awake. That’s all you have to do to survive in A Nightmare on Elm Street. Keep those eyes open in the real world and knife-fingered child murderer Freddy Krueger might just stay away. Let those peepers close though and there’s no guaranteeing you won’t be sprayed all over the ceiling in a blood volcano like poor Glen in the original movie. With that in mind then, let’s look at the various ways the doomed teenagers of the A Nightmare on Elm Street series desperately tried to stay awake. Spoilers, most of them failed miserably… Sweet dreams. Anyone who has dozed off in front of Netflix on the sofa knows just how pointless watching movies can be when it comes to staying awake. However, in the very first A Nightmare on Elm Street Heather Langenkamp’s Nancy Thompson tries just this. While she actually survives the movie, in an attempt to desperately not meet Freddy, she settles down to watch the first Evil Dead movie. While on the surface, this is a not so valiant attempt to keep from dozing off, the choice of movie is no accident. This scene is one of many sneaky horror nods between Elm Street director Wes Craven and Raimi that all kicked off when Craven featured a torn up Evil Dead poster in his previous nasty horror, The Hills Have Eyes. Getting sleepy yet? No yawning allowed. We’re only on tip number two and this is only if the movie watching doesn’t work. Later in the original A Nightmare on Elm Street, Nancy starts relying on caffeine to keep herself awake. Downing endless coffee and taking pills, she bravely turns the jitters into anti Freddy fuel. And it works. After all, we’ve all been up at 3am staring at the ceiling and obsessing over the minutiae of the day after accidentally drinking two espressos after four o’clock. It’s time for a Starbucks, otherwise you’ll be ordering your death extra wet with no foam. Oh, Glen… No, not The Walking Dead’s unfortunate baseball bat victim. Johnny Depp’s first ever film role back in 1984 saw him playing the clearly far too sleepy Glen Lantz, the unlucky boyfriend of Nancy Thompson in the original movie. All Glen has to do is stay awake to go and help Nancy take on Freddy but despite donning his headphones, cranking them up and resting a television on his chest, Glen succumbs to the Sandman. In one of the franchise’s most famous death scenes, not only does Freddy reach up and swallow him into the bed, TV and all, Glen is sprayed back out into the room in liquid form and coats the ceiling in a geyser of B Negative as his mother screams in terror. Ouch. If this sounds like too modern and new fangled solution for 80s’ teens, it is. The 2010 remake of the original A Nightmare on Elm Street sees Rooney Mara’s Nancy Holbrook injecting adrenaline stolen from a hospital to try and survive the wrath of Freddy. 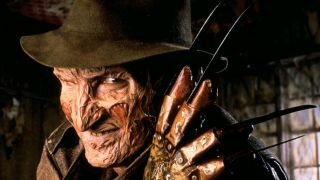 Despite new modern Freddy - played by Watchman’s Jackie Earle Haley - leaving Nancy as his last victim to keep her asleep forever, an injection of adrenaline from her surviving friend pulls her back into reality along with Freddy and she manages to lop his legendary hand off. However, while Nancy survives, there’s still no happy ending as Freddy drags her mother headfirst into a bathroom mirror. So good luck finding that adrenaline, eh? Coffee might be a safer option.